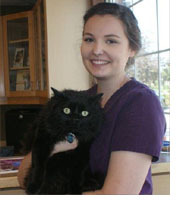 Our professional staff members at Heritage Hills Veterinary Clinic care about all animals, small to large. As pet lovers and owners themselves, our staff members know what it’s like when your furry friend needs help with their health and well being. With over 25 years of veterinary experience, Dr. Khehra has a vast knowledge in all aspects of veterinary medicine but has a special interest in emergency medicine. After many years of working in various clinics in Edmonton and area, Dr. Khehra decided to open Heritage Hills Veterinary Clinic so that he could build closer relationships and have a better understanding of each individual client and patient’s needs. 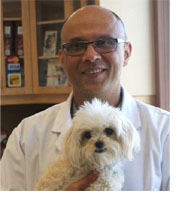 Currently Dr. Khehra lives in Sherwood Park with his wife and two children as well as his dog, Misha. His compassionate nature and gentle approach will help you and your companion feel safe and confident that you are receiving the best possible care. Carla has been with Heritage Hills Veterinary Clinic since July 2010 and graduated from NAIT’S Veterinary Medical Assistant Program in 2012. Originally from Florida, Carla currently lives in Edmonton and has a full house of pets with her two dogs, Hudson and McGee, and her guinea pigs, Nora and Navi. Carla understands the important role that pets play in our lives and she enjoys being able to help clients and patients have a good experience when they come to visit. 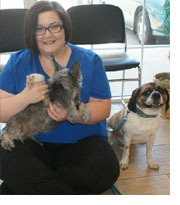 Heather has been with the Heritage Hills Veterinary Clinic since March 2012. She is attending University to eventually become a DVM. Heather lives in Fort Saskatchewan with her cat, Samson and dogs, Theodore & Henry. Heather has always had a love of animals and the favorite part of her job is seeing patients leaving the clinic healthier and happier.